3. Receive email confirmation from CAMI. 4. Plan your trip to University of Washington – Seattle, WA! Completing the ANWAF group application earns your group members full participation in all of the activities and classes during the day, ensures your group a clinic 1-on-1 with a qualified a cappella coach, secures you a daytime performance opportunity for your fellow festival-goers, and includes a ticket for entry to watch the evening concert. The group application (cami-nw.org/anwaf) is due at 11:59 PM PST on March 22, 2019. 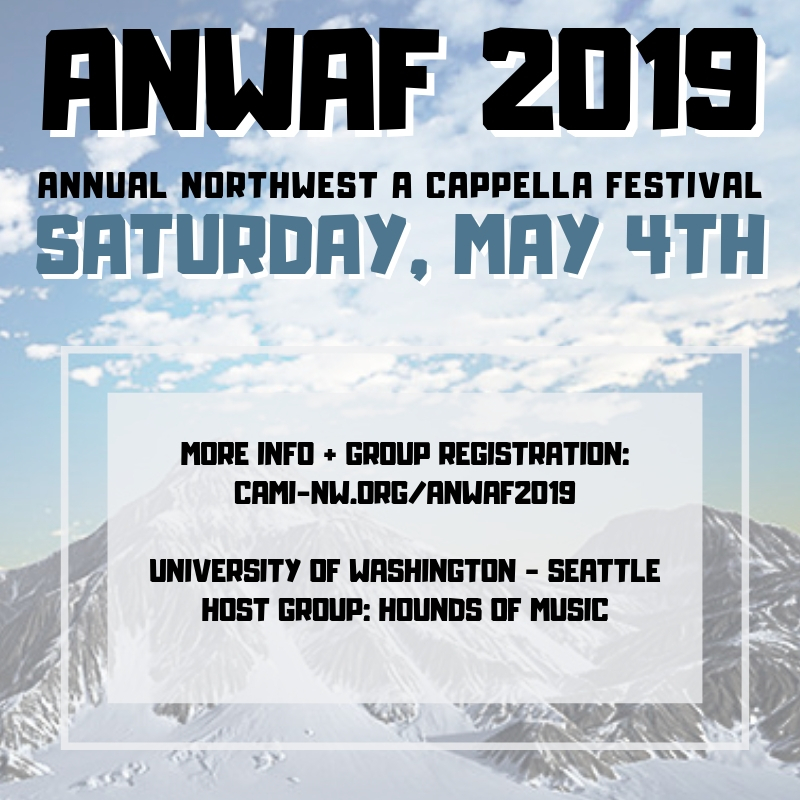 ANWAF 2019 has spots for eight performing groups in the evening concert so get your applications in quickly to be a part of the fun! If you have any questions please don’t hesitate us to contact us. The evening concert at ANWAF 2019 will comprise of groups selected through an audition process. Though this is a change from previous years, CAMI believes that selecting a set number of groups for the evening concert offers many benefits to the festival. The concert will feature groups chosen in order to maintain diversity in the performances and to promote a more concise, entertaining, and fulfilling show for the audience. We recognize that this change is necessary for the growth of this festival and allows for participation from more groups every year. It is a goal of our organization to promote a cappella education, advocacy, exploration, growth, and group networking for the Pacific Northwest a cappella community and we strive to make sure our festival provides as much as possible to this community. By applying to ANWAF 2019, you are agreeing to a Group Registration Deposit of $25 (+online processing fees) to secure your concert slot (first 8 groups), and the remaining Registration Fee of $75 to confirm your spot in the festival. CAMI is a non-profit and all funds will go directly towards the cost of the venue, staging, sound equipment, and sound/staging/lighting personnel. Please feel free to contact us at cami.information@gmail.com with any questions, concerns, or inquiries. The CAMI team is ecstatic that you are interested in ANWAF, and we can’t wait to see you all in April!